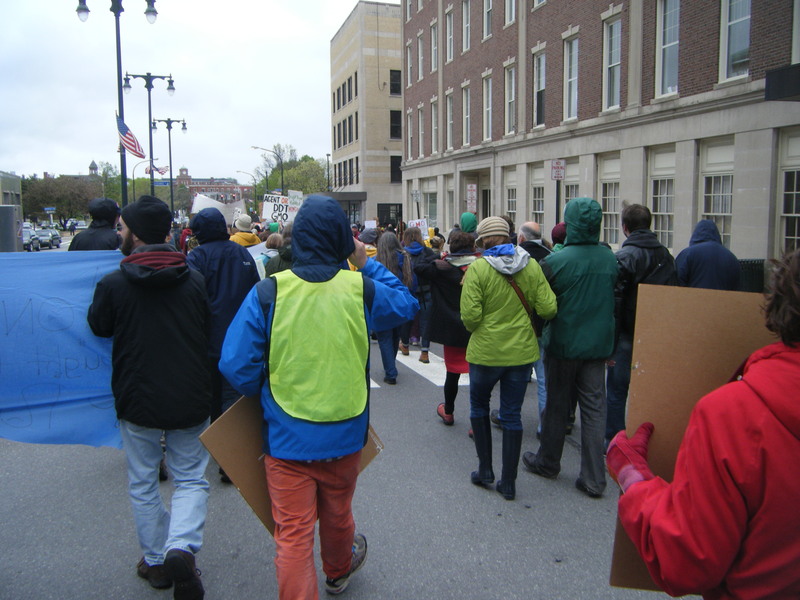 It was a raw, windy day in Portland, Maine, as protesters like me gathered in Monument Square to raise their voices against Monsanto. To our great relief, the rain held off. Sadly, the PA system wasn’t loud enough to carry over the crowd. I longed for Occupy’s “people’s microphone,” a call and response that encourages brevity while inviting the whole crowd to pitch in on the speechifying. I gave up trying to listen. Instead, I decided to make myself useful and stand with my sign (Monsanto = Fox; FDA = Henhouse) with others along the stretch of Congress Street across from the Portland Public Library. Many cars honked. I was surprised how many cars honked. The people inside waved and pumped their fists in support. We on the sidewalk cheered in solidarity. The energy was palpable. Finally, the march began to move, and suddenly the street was filled with protesters. I have participated in a number of protests, but never have we taken over the streets. We were two blocks long at least, and I was somewhere in the middle. It was a sea of people. We took a right onto Fore Street, and then up to Spring. As we marched past the Holiday Inn, I looked up to see three people way up near the top floor standing in the window and pumping their fists in solidarity. I pulled out at Congress Square, stood and watched the long line of protesters pass, and then headed home. When I turned onto my street, my neighbor, Irving, who is 15 now and still helps me out in the garden now and then, called out a hello. My answer was no. That I was done protesting for the day. But that was not completely true. I was coming home to write, and after I write this post, I’ll be making revisions on my mammogram piece. The one about conflicts of interest in the breast cancer awareness campaign, and about the dearth of attention given to prevention and the environmental sources of breast cancer. And believe it or not, Monsanto even makes an appearance in the essay. Did you know that Monsanto sponsors Race for the Cure in St. Louis, Missouri? Did you know that a Monsanto subsidiary launched a new variety of cherry tomato called the Pink Pearl, which was sold in packaging displaying the pink ribbon? Yeah. I didn’t feel like I did a very good job. Irving didn’t ask any further questions, but he was not dismissive, either. He said, “So what are you doing? Just walking up and down the street with your sign?” This made me smile. “No,” I said. “I was just up there with about 500 people, and we filled Congress Street. Have you ever been to a protest?” No, he hadn’t. He asked me what I was doing the rest of the day.